Forest Garden 6 x 8 Premium Tongue and Groove Pressure Treated Apex Shed: The pressure treated finish of this Forest Garden 6 x 8 shed means that you will not have to spend time treating the wood every year which means you have more time to sit and enjoy the sunshine. This garden shed has a single door to the front and a window to the side both of which has high quality stainless steel fittings, the window is glazed with premium acrylic and the single door has double Z framing for added strength. This garden shed is supplied with a traditional apex style roof which slopes down the sides from the central ridge. 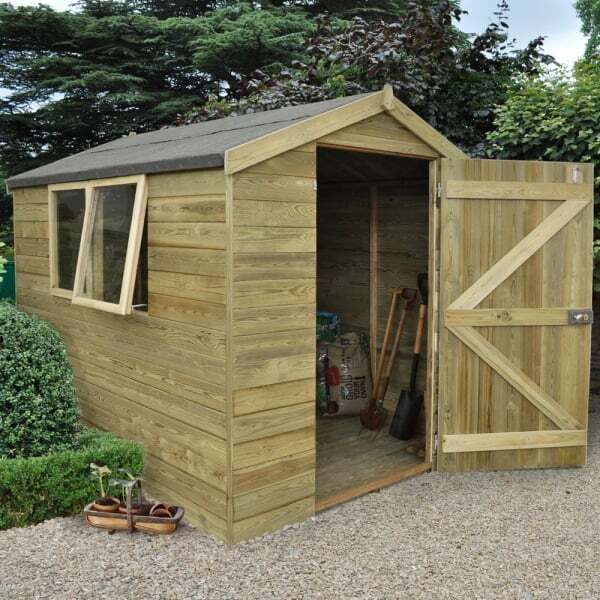 To provide you with a stylish finish this shed comes complete with smooth planed barge boards and finial. Your new shed will be delivered in easy to manage sections for assembly by at least 2 people. This garden shed from the Forest Garden Premium range is constructed from tight fitting tongue and groove boards which will ensure protection against the wind and rain, the premium range has the added benefit of a tongue and groove roof and floor, the floor is pressure treated for durability and extended life expectancy and the roof is covered by the included waterproof shed felt roofing material. The timber in this shed has been sustainably sourced and is FSC certified for your peace of mind and the shed includes a 15 year guarantee against rot and fungal decay.